Infrastructure describes the equipment and structures the city owns, that we all use and benefit from. It helps us at work, at home and at play. Roads, bridges, stormwater drains and sewers, sidewalks, streetlights, traffic signals, community centres, libraries, fire stations, pools, arenas, parks, trails, playground equipment, theatre, buses and bus shelters. Read the Mississauga infrastructure brochure to know what the City is responsible for. It makes our city safe, convenient and livable. It adds to the quality of our lives and contributes to our overall health and well-being. It makes our city an attractive place to live. It makes businesses want to locate here. What’s the value of our infrastructure? 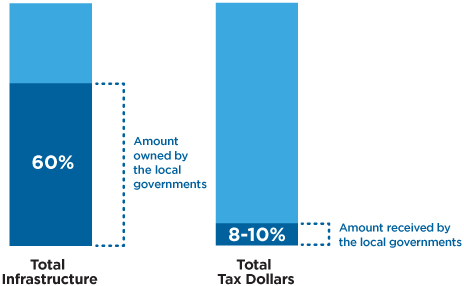 Local governments own the majority of infrastructure within its boundaries (60%); but among all levels of government, local governments receive the smallest share (8-10%) of all tax dollars collected. Because it helps us avoid excessive future repair costs. Paying for the initial infrastructure is one thing but all the things we own require maintenance and upkeep. The timing of this is really important. If a building has a leaky roof it needs a new roof or at least some repairs. If you don’t fix the roof when it needs it, you might be paying for water damage and a new roof later on. Taking care of our infrastructure in a timely way is called Asset Management. It helps us protect our investments and avoid future costs. What is the City's infrastructure Gap? The City of Mississauga owns infrastructure assets worth $9.2 billion. The depreciation expense represents the minimum amount that should be put aside each year to replace infrastructure in the future. 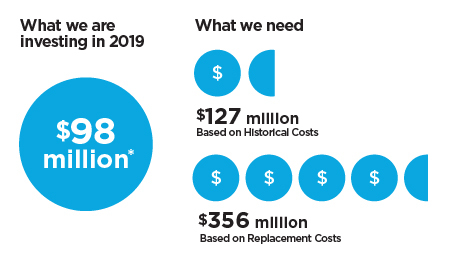 Depreciation based on historical costs would be $127 million, making the gap between what is funded and what is needed $29 million. 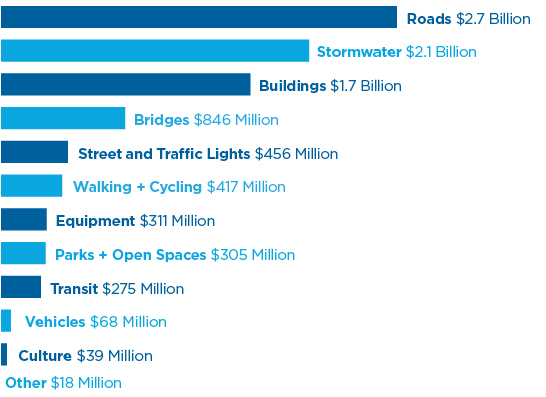 Depreciation adjusted for estimated replacement costs would be $356 million, making the real infrastructure gap $258 million. We are applying some specific measures to address certain infrastructure costs, such as a 2% Capital Infrastructure and Debt Repayment Levy which has been added to the property tax bill. We are looking to the Federal and Provincial Governments to help us solve this problem. How well are we currently maintaining our infrastructure? The good news is Mississauga’s infrastructure is in pretty good shape. The bad news is it is taking more money to keep it that way. 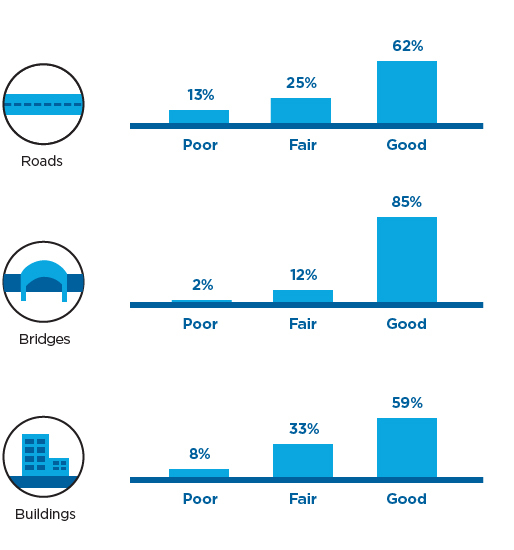 Here’s how the condition of our roads, bridges and buildings looks. Mississauga is a young and thriving city with fairly new infrastructure. It’s important for us to look after our infrastructure and keep it in a good state of repair. By doing so, we are putting safety first and making sure that Mississauga continues to be a great place to live, play and do business in the future.